Home / Engagement rings: Custom Design / Solitaire Diamond / “Renee” Princess cut diamond solitaire. “Renee” Princess cut diamond solitaire. A solitaire diamond ring set with a 1.25 ct F/VVS1 princess cut diamond. 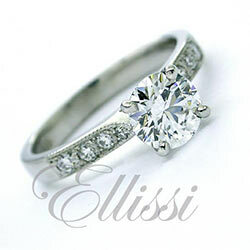 The ring design consists of a 4 claw setting in cross over wires with central rail construction.